Many of the health benefits we can get from carrots. Carrots are foods low in fat and high in fiber, making it become food or a healthy snack. In addition, carrots are also rich in vitamin A, low sodium, and no cholesterol. Carrot is a plant that is very beneficial to the human body because it contains a lot of beta-carotene. Beta-carotene is essential for eye health. In addition, carrots are also a good source of vitamin B1, vitamin B2, vitamin B6, vitamin K, biotin, fiber, potassium and thiamine. Carrots or called Daucus carota is a vegetable that grown throughout the year, especially in mountainous areas that have cold temperatures and humid, at an altitude of approximately 1200 meters above sea level. Carrot plants can be grown in almost any season. There are more than 100 varieties of carrots, ranging from color and also its size, from the little over two inches to three feet. Here are the nutrients in carrots. Carrots are a good source of vitamin A which is very good. Each serving of carrots (about 1 cup) contains 20.380 IU vitamin A, or the equivalent of 408 percent of the recommended daily value. Vitamin A can improve the health of the eyes, gastrointestinal tract, urinary tract, and mucous membranes. Carrots also contain vitamin C, vitamin K, and potassium in high amounts. A serving of carrots or about 1 cup, provides 50 calories. Although in large quantities, the calories contained in carrots is very little, so that makes carrots, good, serve a snack without worrying about your weight gain. A serving of carrots contains only about 0.3 grams of fat. Carrots are a good source of fiber. One serving contains 3.4 grams of dietary fiber. Carrots contain 11.7 grams of carbohydrates in each portion, about half come from sugar. Here are the health benefits of carrots you need to know. Many studies show that eating carrots can help lower the risk of breast cancer, lung cancer and colon cancer. More recently, researchers have isolated a compound called falcarinol in carrots that may be largely responsible for the anti-cancer benefits. Falcarinol is a natural pesticide found in carrots that protects the roots from fungal diseases. In the daily diet, carrots almost the only source of these compounds. Retina of the eye needs vitamin A to function, vitamin A deficiency causes night blindness. Carrots are rich in beta-carotene, a substance that is converted into vitamin A in the liver. In the retina, vitamin A is transformed into rhodopsin, a purple pigment necessary for night vision. Studies show that a diet high in carotenoids are associated with a lower risk of heart disease. Also, it is believed that regular consumption of carrots reduces cholesterol levels. According to research from Harvard University, people who ate more than six carrots a week are much less likely to suffer a stroke than those who ate only one carrot a month or more. Carrots have powerful cleansing properties are effective in detoxifying the liver, so it is very effective for acne is caused by toxins from the blood. Carrots are also useful for treating uneven skin tones due to pigmentation. Carrots contain a lot of beta-carotene, which act as anti-oxidants that help the body to fight free radicals. It also helps slow the aging of cells and a variety of negative effects associated with aging. Carrots can even help clean the teeth, and is the best way to keep the mouth clean after eating. Carrots acts as a natural cleanser that helps in removing dirt and plague from the teeth and gums. Carrot is a vegetable that is truly amazing. There are many benefits of carrots and easy to add to a diet without extra preparation. Carrots, either as raw or cooked fruit juice in the form of good for health. There are several things to consider when shopping for carrots at the market or supermarket. 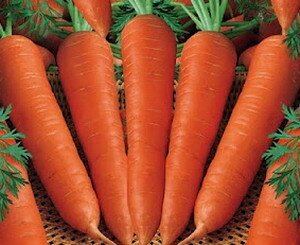 Choose carrots with bright orange color because it has a lot of content of beta carotene. In addition, check the appearance roots. The root of carrot quality is smooth, strong and light in color. Avoid choosing a forked carrot, cracked, or faded. Dark colors on the tip of the carrot sticks are also a sign that the carrots are old and should not be consumed. Carrots have good potential to be cooked and made ​​cakes. Lots of tasty and delicious recipes that you can make using carrots as the main ingredient. Some of the dishes include carrot soup, carrot jam, spicy carrot soup, carrot zucchini bread, carrot cesserole and classic carrot cake. Although carrots has many positive benefits for health, but excessive consumption of carrots can cause a condition called carotoderma. Carotoderma is a condition in which the palm of the hand or any other part of the skin orange or yellow because of high levels of carotene in the blood. Reduce your intake of carrots is the best way to eliminate carotoderma. So make sure not to overdo it when you eat carrots.